Thank you Sarah Wells Bags for sponsoring this post. All opinions expressed below are completely my own. My first pregnancy was five years ago and I felt like I had access to quite a lot of fabulous products. This time around, I've learned about so many other products that I had no clue about with my first pregnancy. I've found myself declaring many times, "that's a baby product that I wish I knew about the first time around." I'm considering it my duty to share about these fabulous products I've discovered. Awhile ago, I shared about my breastfeeding journey, so most people are aware that I'm definitely no stranger to a breast pump. And I'm sure everyone is aware that I like to look pulled together and carry cute bags. Which is why I'm absolutely stoked that I discovered Sarah Wells Bags. Let me take you back to my very first breast pump. It was a Medela pump that my insurance covered and had me order from a medical supply company. In one word, the bag was ugly. It was a yellow/brown color, shaped like a cooler and there was no denying I was carrying some sort of medical device. I tried to camouflage it as best I could, but I really did not enjoy the look of it, especially for as long as I used it. While there was plenty of storage for my pump and all of its parts, there was not any extra space for any of my personal items. 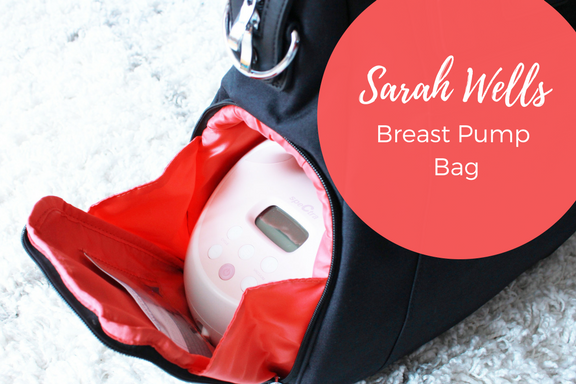 With this pregnancy, I have decided to try a different brand of breast pump that did not come with a bag so I started looking for something with lots of pockets and inside storage that could accommodate everything. I found Sarah Wells Bags and immediately fell in love. 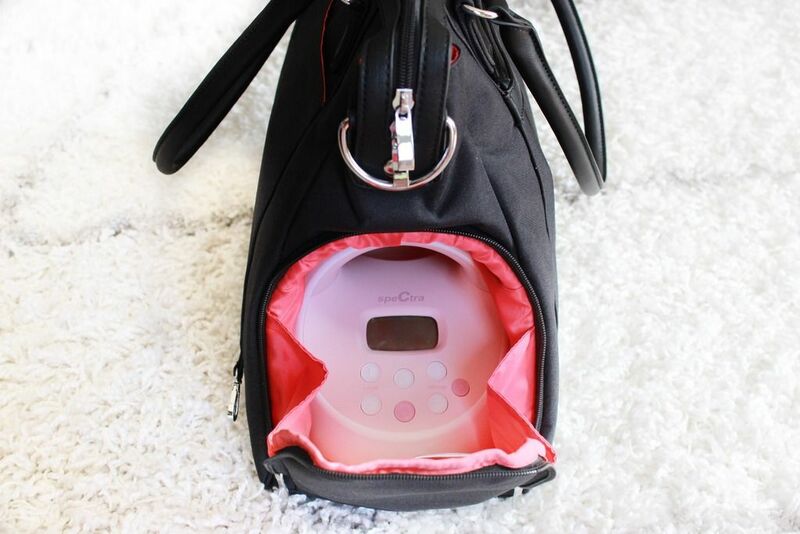 Their bags fit all sorts of breast pumps, BUT they look like purses and stylish bags. No medical looking bag here. After discovering the bags, I checked out how Sarah Wells started her company and I felt like I was reading my own story. I too used to work in Washington, DC after my first child and had to carry my purse (which was much larger than it is now), a lunchbox and a separate bag to carry all of the other things I might need for working late nights at the theatre. Hello bag lady! 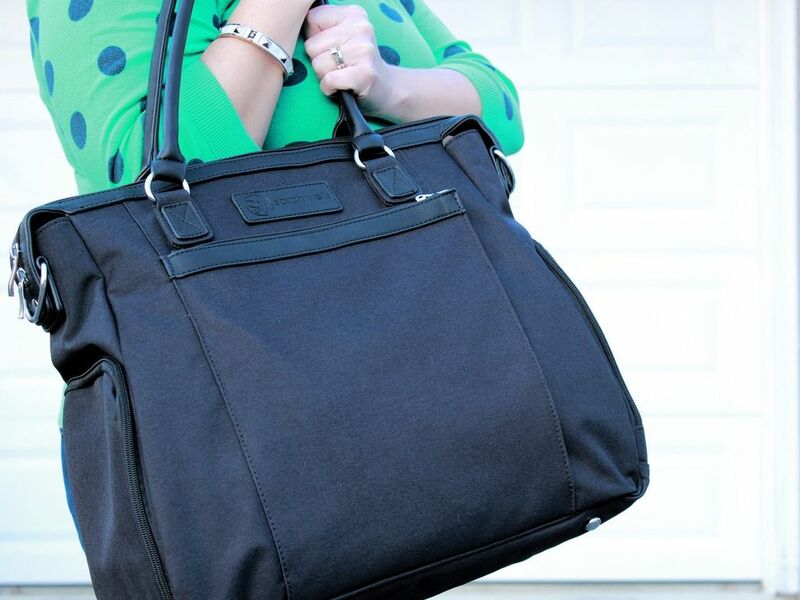 The beauty of a Sarah Wells pump bag is that you can carry everything inside it, eliminating the need for multiple bags. 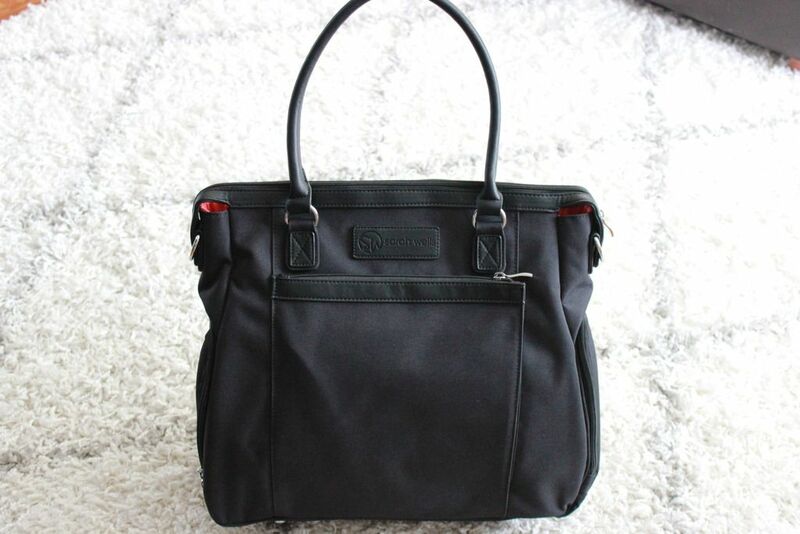 I have the Claire bag in black and I'm blown away by how much room there is inside and that the bag looks like a chic travel bag/tote. 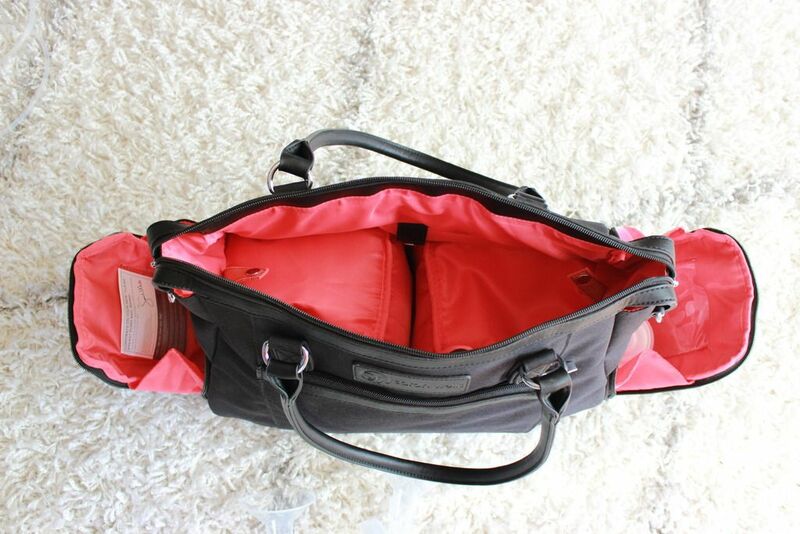 The organization junkie in me absolutely adores this bag, because there are pockets everywhere (12 to be exact), allowing you to store so many of your everyday/personal items. There are side pockets that allow you to easily access your pump and operate it from within the bag - no need to pull your pump out. The bag also includes easy to clean nylon for those inevitable days where something might get spilled. And such a cute part of the bag is that there are two clear photo pockets, allowing you to slip pictures of your kiddos inside where they won't get damaged. 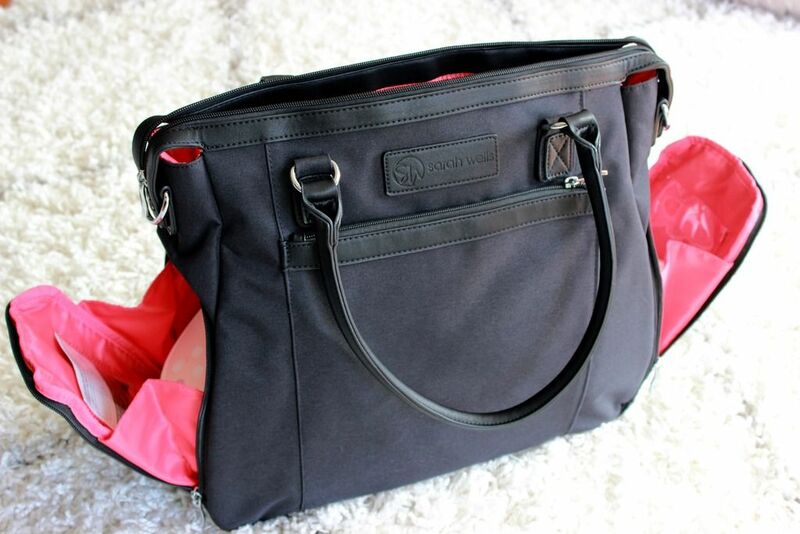 This bag was clearly made by a very smart mama with other mamas in mind. There are multiple styles of bags that come in several colors and patterns. I'm sure any pumping/breastfeeding mama will find a bag that fits her style. I'm super excited that this time around I truly will be pumping in style!!!! And I have a special surprise for you...Sarah Wells is going to give away a Claire bag just like mine to one of my lucky readers!!! Head over to my instagram profile to enter. You can enter for yourself or someone you might know who would need this. Hop over there now, the giveaway will be open until 11:59 p.m. on Sunday. This bag look so nice. It much nice then the bag my pump came in. Have a great weekend.